Whether in the field, in the office, or on the Board of Trustees, everyone who works for the Philadelphia Outward Bound School is committed to the same mission: to change lives through challenge and discovery. Read on to learn about our field staff, our administrative staff, and our Board of Trustees. As a 501c3 non-profit organization, Philadelphia Outward Bound School is led by a Board of Trustees. Trustees work collaboratively to set the course for strategic and business planning, to establish appropriate committees for operational and safety oversight, and to secure the necessary funding for fiscal success today and well into the future. Our administrative staff is composed of dedicated, mission-driven individuals who do the behind-the-scenes work necessary for our programs to run. Though they are not based in the field or at the ropes course, administrative staff see the impact of their work when students return to the office for graduation and share their stories of success, defeat, silliness, and grit. Our field staff are skilled and compassionate experiential educators who teach character development, leadership, and an ethic of service through thoughtfully-designed wilderness-based expeditions and center-based day programs. All courses are staffed with a Lead Instructor and Assistant Instructor. Becoming a Lead Instructor requires many seasons of trip leading and demonstrating consistent, excellent decision making skills, exceptional judgment and numerous extensive trainings. 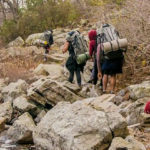 As highly trained outdoor professionals, all instructors are Wilderness First Responders (WFR) — an certification recognized by medical professionals worldwide. Additionally, all of our staff are required to have Federal and State background checks.